Here and there I put together series on various things. I’ve created this nifty little page to have a place for them to call home, and to make it easier for you to find. Ice Cream Week was so special for us. We had a chance to use our new ice cream machine to put together many allergy friendly versions of classic flavors. We also went a little wild and put together new ideas, such as S’more Ice Cream. Click here for the posts. Nut butters can be an essential if you are Paleo or GAPs. This series is near and dear to my heart since I was able to eat one of the cookies. This is not a one week series, rather, one that’s added to on a regular basis. 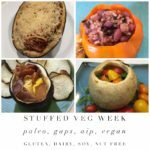 After finding inspiration on the internet, I decided I had to stuff vegetables for an entire week. A lot was learned, and hopefully there’s something here that will suit your fancy.